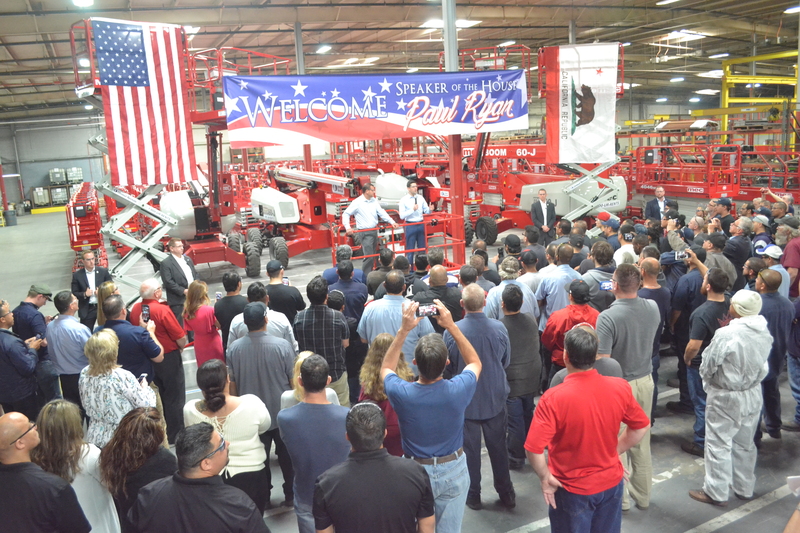 House Speaker Paul Ryan and Congressman David Valadao toured the MEC facility in Kerman, CA to learn more about MEC as an example of the positive impacts of the tax reform on manufacturing in the Central Valley. MEC has benefited greatly from the tax reform legislation that is helping our economy and bolstering new construction. These factors have had a direct effect on the record growth MEC is experiencing. To this, Rep. Valadao added, “we always hear about Ag, but [we have] the opportunity to expand and diversify so there’s more opportunities for people to work”. MEC Aerial Work Platforms is a manufacturer of a line of Aerial Work Platforms in Kerman, California. For 40 years and counting, MEC lifts carry the tradition of quality and innovation. MEC’s portfolio of Aerial Work Platforms ranges from direct electric drive slab scissors to rough terrain booms with patented and award-winning design and safety features. See for yourself how MEC can differentiate you and provide class leading ROIC – full featured value for high performance, productivity and safety. MEC is A Better Solution.